Thinning Hair. What can cause it and what can help? Hair can start to become thin at any stage of your life; it is not something that necessarily comes with ageing, there are many factors that can contribute to your hair becoming thin and sparse. Often the reason is down to genetics and can develop during certain times of your life. There are six key factors that can be the reason that you experience thinning of the hair. Genetics, stress and trauma, nutrition and diet, health issues, environmental factors and medication. All of these factors can contribute or be the cause of hair loss of for your hair to become thin. When it comes to thinning hair this can mean either; fewer strands of hair, your hair strands themselves can become finer or it can be because your scalp is in poor condition and the hair is not in a good environment. There is another cause of hair loss, and this can be down to hormone changes during pregnancy. Pregnancy affects everything, including your skin, nails and hair. After childbirth your estrogen levels drop suddenly and your hair follicles that are resting can fall out. This is all due to fluctuating hormones and hair loss can be experienced during and after pregnancy. You would normally experience hair loss between three to six months after giving birth, however it is often that as your bodies hormone level returns to its natural, pre-pregnancy hormone levels your hair tends to revert back to its normal state. There are many products and treatments available, one range that has 20 years of specialisation in thinning hair and is the winner of the Stylist Choice Award for 10 years in a row, Nioxin. Nioxin used highly specialised formulas that work together to give you healthier and thicker hair and over 70% of users notice that they are left with noticeably fuller looking hair in 30 days. Nioxin products have a proven track record when it comes to providing results for clients with thinning hair, and have six customised systems to help treat thinning hair and are based on their three diagnostic questions; what is your stage of thinning? What is your hairs texture? What is your scalp and hair condition? Tailoring your products and using the three part system alongside each other over a period of time will undoubtedly give your hair of thicker and fuller appearance. 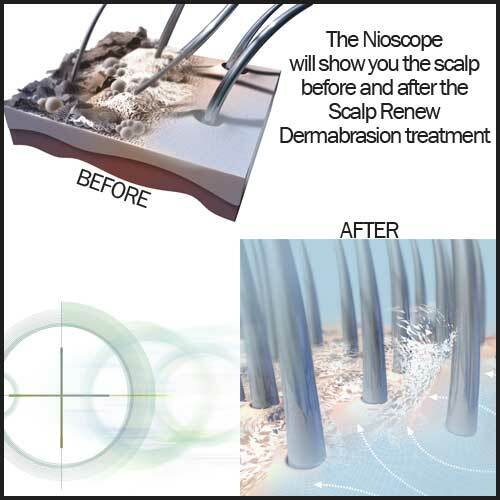 To get the best results from this service we recommend using the Nioscope before and after the Nioxin Scalp Renew Dermabrasion, a facial for your scalp. This invigorating service is suitable for both men and women, working to regenerate and revitalise the scalp while accelerating scalp regeneration up to 34%. By using the Nioscope before and after this treatment it will allow clients to not only experience, but see the immediate, visible results.